Do you only care about the NCAA tournament because you want a look at the best players in the upcoming NBA draft? Wonderful news. You are in the right place. Here’s a handy viewing guide for March Madness this year. A note: The numbers represent players’ placement in the latest DraftExpress Top 100 Prospects rankings. This is a game that is not only loaded with NBA prospects, but also features one of the more intriguing head-to-head matchups, both tactically and stylistically, between Andre Drummond and Royce White. Drummond is an incredibly physically gifted yet hopelessly limited offensive player who can be absolutely dominant defensively in stretches, while White is a Boris Diaw clone — a 6-foot-8 forward with the passing and ballhandling skills of a guard, but the girth of a 35-year-old center. Both Drummond and White are just as talented as they are frustrating. It will be fascinating to see what happens tonight. 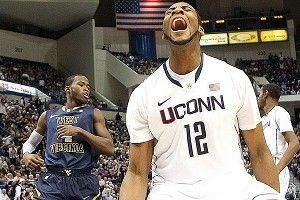 Any draftnik worth his salt will be openly and emphatically rooting for UConn. That would set up a potentially legendary showdown between Drummond and Kentucky’s Anthony Davis. The two big men were once considered equal contenders for the no. 1 overall pick. Unfortunately, Drummond did very little for most of the season, while Davis had an impressive freshman campaign that effectively ended that conversation pretty early on. Nevertheless, many have wondered what would happen in the unlikely event that Drummond could actually outperform Davis in a tournament setting — would that be enough to put him back in the good graces of NBA scouts and earn him looks for the no. 1 overall pick? Only one team has yet to play a single NCAA tournament participant. Will South Dakota State’s first be its last? Not if Nate Wolters has anything to say about it. Despite being tucked away in the obscurity of the Summit League, Wolters — a 6-foot-4 highly fluid and creative floor general who is absolutely lethal on the pick-and-roll — has emerged as one of the most intriguing point guards in college basketball. Can Wolters create offense and get into the lane against NBA-level athletes? That’s the question scouts have been asking all season, and what better team to evaluate him against than Baylor, probably the longest, most athletic team in college basketball? This has all the makings of a great game. Every March, there is one player who ends up breaking through and establishing himself as a legit NBA player, and this year, Drew Gordon could very well be that guy. At 6-foot-9 with an NBA body, Gordon has ample physical tools to go along with some of the best rebounding instincts of any player in this tournament outside of Kansas’s Thomas Robinson. Gordon should feast on Long Beach State’s undersized frontcourt in a game that won’t be much of a contest unless Grantland darling Casper Ware gets hot. If you haven’t seen Mike Moser and Andre Roberson in action yet, you might want to stay up late for this one. Moser is a rangy, versatile, and energetic combo forward in the Wilson Chandler mold — a terrific rebounder and athlete who can do a little bit of everything. He’s extremely smooth yet not very polished, and is still trying to find a real position on the floor. When his 3-point shot is falling, Moser looks like a potential NBA lottery pick, but he’s struggled over the past month or so. Still, there’s no better time than March for a prospect to rebuild his draft stock, and that starts with this game. He couldn’t have picked a tougher matchup, though, as Andre Roberson is a ridiculously tough and athletic forward who ranks as the no. 1 rebounder among all prospects in college basketball. Only a sophomore, Roberson also lacks refinement, especially offensively, and doesn’t have a real position at this stage. While he might be a year away from really establishing himself as a legit first-round pick, all it takes is one big NCAA tournament outing for a prospect to rocket up draft boards. The real stars in this game — Rick Pitino and Bob McKillop — will be on the sidelines, but there are still a handful of prospects to watch tonight. Wayne Blackshear missed most of the season with a shoulder injury, and has had a difficult time cracking the team’s rotation since returning. Nevertheless, the former McDonald’s All-American is considered a surefire future pro, and is overdue for a good performance after being cleared more than a month ago. Peyton Siva gets to wherever he wants on the floor, as he might be the fastest end-to-end player in college basketball — a skill that surely translates to the NBA. Unfortunately, he rarely knows what to do once he’s inside the paint, and is an extremely limited perimeter shooter. Sophomore Gorgui Dieng is another player to keep an eye on, as he has the size, length, and mobility to crack an NBA team’s rotation as a utility big man. He’s an excellent offensive rebounder and shot-blocker.